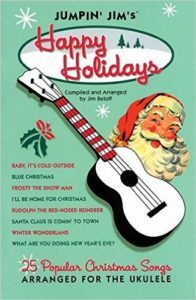 NEW: Our Songbook page now has the 8 Christmas songs from the green Happy Holidays book that AREN’T in the Big Yellow! Head on over to download them. It’s that time of year again and PUG will be performing at Dec. 9, 2016 at Acker Night. In preparation, we’ll be going over our standard songs at the November 3 Meeting. We use the Jumpin’ Jim’s Happy Holiday Book (available at Pop’s Music or at Amazon.com). Some of these songs are in the Big Yellow Book – see the note above. If you just need the notes for these songs, here’s the link to download them now. Mele Kalikimaka!